Domesticated blackberry (Morus Nigra) is the fruit of the black, white or red blackberry bush. It belongs to the Moraceae family. In summer, wild versions of it (Rubus Fruticosus) can be found, usually in dense briar patches. It belongs to the Rosaceae family, like raspberry. Wild blackberry is said to be native to Asia Minor. Domesticated blackberry, for its part, seems to be native to Europe. Surprisingly, they look very much alike. On market stands in our areas, one can find ‘Black Diamond’, ‘Jambo’ and ‘Black Pearl’ cultivars. 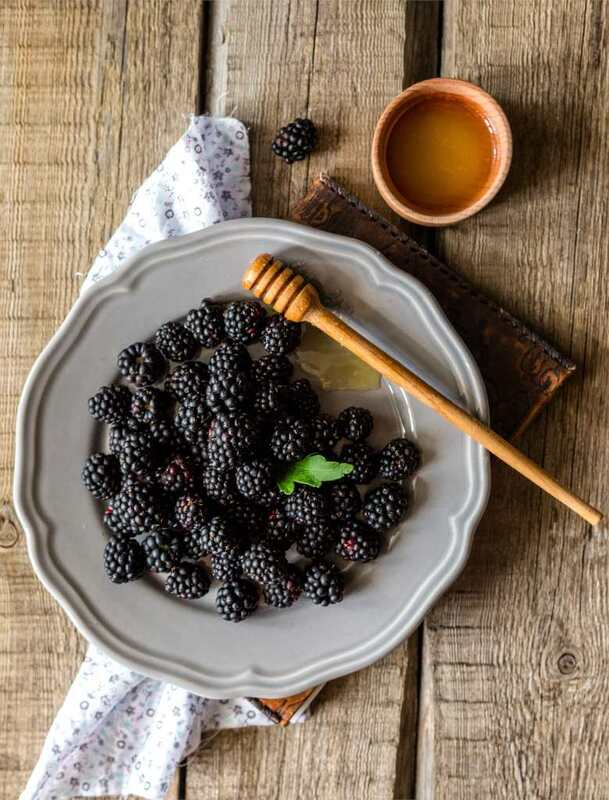 Blackberries are appealing for the joy one finds in harvesting, cooking and eating them for those with a sweet tooth, and also for its health benefits on the body and its properties useful in cosmetology. Blackberry has been used for its medicinal properties for a long time. Indeed, American Indians used wild blackberry thornbush roots to alleviate asthenia in women after they had born a child. Americans used it as a remedy against diarrhea, too. In Greek and Roman times, it was already used to treat sore throat (Greeks). According to Greek mythology, blackberry was bred from the blood of the Titans, slain during the war against the Gods. Blackberry has been cultivated in Europe for over 2000 years. Blackberry is swollen with water (85%), it is thus diuretic. It can hydrate and cool the body, and also treats urinary tract infections, gout and cystitis. As regards digestion, blackberry is a laxative. It contains fiber, 17 g / 3.5 oz (100 g) that regulates transit, eliminates parasites, reduces inflammations and heartburn in the stomach and intestines. It is also a very good anti-inflammatory. It reduces inflammations in the gums, pharynx (pharyngitis) and larynx (laryngitis). It is very effective in case of pharyngitis, sore throat, canker sores and hemorrhoids. Blackberry has antipyretic properties, its juice can lower fever. It is also a very antioxidant. It contains vitamin C, 32 mg / 3.5 oz (100 g) and vitamin E, that slow premature ageing and protect the body from micro-aggression by contributing to proper function of our immune system. It also acts as an anticancer agent since its antioxidants help control anarchic proliferation of cancerous cells. 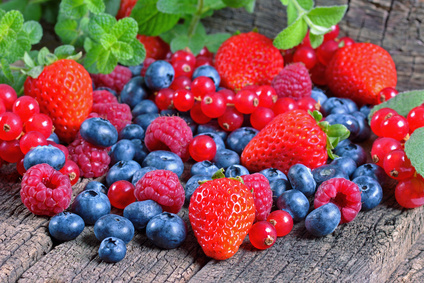 Additionally, flavonoids are pigments that protect the cardiovascular system by reducing bad cholesterol levels. 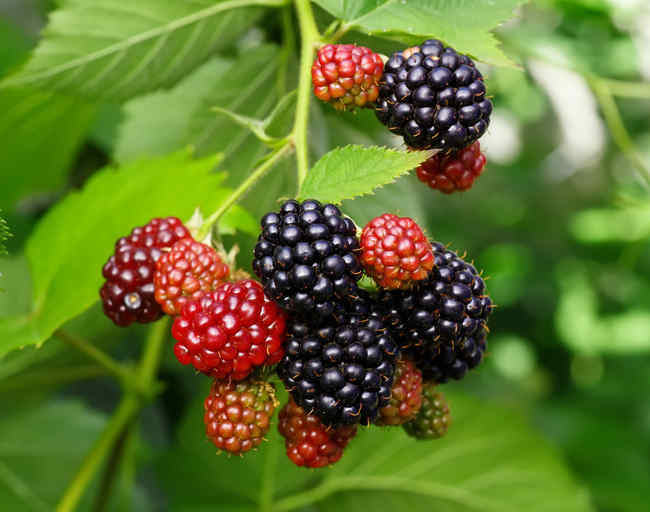 Blackberry thus prevents emergence of cardiovascular diseases and type 2 diabetes. Its high vitamin C content makes blackberry an antiscurvic agent. It contains iron: 2.3 mg / 3.5 oz (100 g). It is recommended in case of anemia. Blackberry leaves are astringent. They speed up the wound-healing process thanks to their antiseptic and antimicrobial properties.Its leaves are used in case of light wounds. Blackberry syrup – for sore throat or to eliminate intestinal parasites. Boil 35 oz (1 kg) blackberries in 6¾ fl. oz. (20 cl) water. Sieve to remove seed kernels. Weigh the remaining juice, and add 1½ times that weight in sugar. Heat up for a few minutes. Stop heating before the syrup boils. Blackberry juice – in case of fever. Herbal tea prepared from blackberry leaves – boil water with a handful of blackberry leaves. Filter, and drink all day long. Indications: sore throat, irritable throat, canker sores, pharyngitis, laryngitis and urinary tract infections. In poultices – Wild blackberry leaves are useful to treat light wounds. Contraindications – Since its glycemic index is very low, it isn’t contraindicated for diabetic persons. Blackberry boasts low calorie intake: 43 kcal / 3.5 oz (100 g). Blackberry provides many vitamins (C, B, E and A), minerals (potassium, calcium, magnesium, phosphorus) and trace elements (iron, copper, zinc). For dessert, blackberries can be savored raw or cooked, sometimes with cottage cheese, added to pies, muffins, coulis, jelly or jam. More refreshing options are spooning it as ice cream or smoothies. Blackberry coulis is delicious when drizzled on warm goat cheese on toast (for your mixed salads and appetizers). You can also add it to gravy for meats. Blackberry is also present in cosmetics for its health benefits. Since it hydrates so well, it can care for your dry hair and skin. Blackberry seed essential oil is a very good anti-wrinkle agent. The antioxidant compounds present in the blackberry slow skin ageing. Additionally, it nourishes and rehydrates skin. When harvesting, avoid blackberries that are too close to the ground, best pick the ones that are up high. How to remove blackberry juice stains from your laundry? Rub half a lemon in a circular motion on the stain before launching the washing cycle. Keeping your blackberries – Blackberries are fragile and won’t keep very well. Best keep them in a cool place, or in the refrigerator.